A noticeably friendlier pub that has added more than the old staples of people watching and posing. About: The Cat & Mutton is a gastro pub serving modern British food, fine wines and real ales. The Broadway Market pub isn’t renowned for its Sunday lunches but we think it should be. Sure there’s a lot of great atmosphere at The Cat and Mutton on Sundays, everyone drinks like they don’t have a job to go to on Monday morning, but the roast is the pub’s key Sunday ingredient. It is delicious. Excellent local ingredients, cooked simply and well. "A noticeably friendlier pub that has added more than the old staples of people watching and posing. " The Cat and Mutton might not have been the hippest place on Broadway Market anymore at the start of 2014 but who knew it had slipped so low as to require closing down and starting again? Not us. But given that since reopening under new ownership it looks great, feels more welcoming and has better beers on draught, it seems like it was a good thing. Taken on by the same people who brought Ruby’s cocktail bar to Dalston, the idea was to reestablish the heart and soul of the ‘Hackney pub’ on this corner of Broadway Market. First, that meant getting rid of the intimidating neck-high bar from behind which the old staff used to loom over all-comers. Next was to open up the space with a new table arrangement and uncover what look like (are?) the building’s original features. The change has shifted the attitude that once pervaded what has always been a grand, handsome pub. The new Cat and mutton is noticeably friendlier – with the staff playing a big part. Naturally you’ll still find a row of stuffed animal heads paraded above the bar but then it wouldn’t be a Hackney pub without them. The change to the interior and atmosphere is a big improvement and the food and drink have followed the positivity. On the taps there is a selection of Meantime beers along with smaller breweries and while the food may not be pushing any boundaries, we look forward to coming back for the Quail egg Scotch egg and the jerk chicken with mango coleslaw. Not done yet, the pub has also made use of the previously under-utilised first floor space. A Ruby’s-esque cocktail bar by the name of Pearl’s has taken residence and exists as a separate entity out of sight – so much so that it deserves its own review. 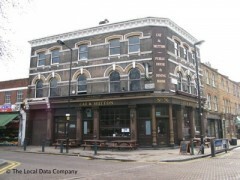 The Cat and Mutton’s prime location - on the corner of Broadway Market, adjacent to the entrance of London Fields – has always been one of its main attractions but the new pub has grown-up and offers much more than posing and people watching. "the love it or hate it capital of Broadway Market"
In certain parts of London a pub will have everyone talking about it because of the area and while the Cat and Mutton happens to be in one of those areas, it lives up to the cheap talk as the love it or hate it capital of Broadway Market. Having helped to make the street a viable destination from anywhere in London, it's now not just market days when the pub's rammed along with the street outside, and by summer it's an everyday occurrence. By swelling the coffers of the off-licenses next door you don't even need to be in the pub to get in on the fun and the choice of street beers means that if you're one of the many who scorn the place you can still enjoy the gathering from a distance. Clearly it's all fashion creative but just because it's a little bit catwalk you shouldn't let that put you off. The giant windows open it up and it’s loud, boisterous and slightly seedy with the whole mess of heavy wooden tables and chairs spread over two floors. It serves a fine menu of modern gastro-style food- fifty-day hung steak, beer battered fish and chips and whatnot, and prices creep close to £15 for a lot of dishes. It’s also got one of the best roasts around on Sunday’s and runs a few good choices of beer on draught, including Red Stripe and an ale or two. In short, enjoy life and don’t hate on the Cat and Mutton, just be happy to have a little bit of community however hard it might make you cringe occasionally. If The Dove at one end of Broadway market is Michael McIntyre, then The Cat and Mutton is Micky Flannigan. If the Dove is Christy Turlington then The Cat and Mutton is Kate Moss. And if The Dove is Bayern Munich then The Cat and Mutton is Borussia Dortmund. Get it? The Cat and Mutton is at the hip end of the market, closest to the delights of 'fashion corner' and it's always fun. Good crowd, good music, good times.